In an earlier post, we mentioned using pilot programs to test opportunities, which can give you specific data to help you manage risks when developing new initiatives. This post provides information about the first step in designing a pilot program: creating a logic model. A pilot program can help you evaluate cost, viability, problems, and performance against expectations. Pilot programs also can help you troubleshoot minor issues – or fix major ones – before any public rollout. Although they can’t predict everything (did Sony ever think that its high-quality Betamax video would be outshined by the lesser-quality VHS format?) pilot programs can provide critical data that can help you make the right decision before committing substantial resources. In order for your pilot program to be successful, you need to create a logic model. As explained by the W. K. Kellogg Foundation, a logic model is a picture of how you think your program will work. 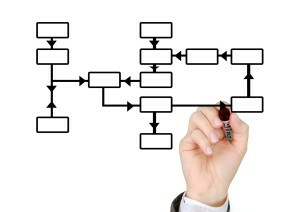 It’s a visual map of your process or program sequence, and it should conclude with your expected results. Resources: What resources are required for the project? What resources are available? Consider financial requirements, human, organizational, and community. In other words, what are the inputs? Activities: What activities will the program perform? In other words, what will the program do? Outputs/Direct Results: What are your intended results? How will those outputs be measured? Impacts: How are those outputs expected to impact the organization? The logic model should not be too detailed. You are aiming to show how the program would work, rather than detailing its components. Sketching this flow out in pictorial form can help establish common ground when developing a plan for a program that may scale.